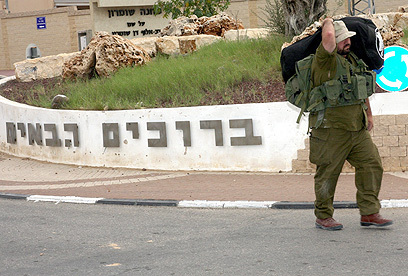 The army began releasing on Thursday tens of thousands of reserve soldiers who were recruited under emergency orders during Operation Pillar of Defense. Prime Minister Netanyahu: Mr. Secretary, welcome to Jerusalem. You’re always a welcome guest, and I appreciate both your coming here and your statement. I want to thank you for making it clear that Israel has the right to defend itself. I want to thank you for your consistent statements condemning the rocket attacks on Israel’s citizens. I know you’re very concerned about the civilian casualties on both sides. Well, we share your concern, and that is why, in fighting terror, our military always tries to avoid civilian casualties. In fact, I’m not sure that there is another military on Earth that goes to such great lengths to keep innocents out of harm’s way. Israel is, I think, remarkable in that, when you consider the conditions that we’re facing, I think that something almost without parallel in history is taking place. We’re conducting these surgical operations against terrorists at a time when our own population is being bombarded by rocket attacks. Unfortunately, Mr. Secretary, Hamas and the Islamic Jihad, and the other terrorist groups, do not share your concern about our civilian casualties or about civilian casualties at all. They’re deliberately and indiscriminately targeting our civilians and they deliberately hide behind their civilians. The terrorists target our children and they use their own children as human shields. They place explosives, weapons, other destructive weapons of any kind in schools, mosques, hospitals, universities. Targeting civilians and hiding behind civilians, as you well know is a double war crime. If we hope to make these tactics illegitimate, they should be condemned in the most forceful terms by all responsible members of the international community. The moment we draw symmetry between the victims of terror and the unintended casualties that result from legitimate military action against the terrorists, the minute that false symmetry is drawn, the terrorists win. I know, Mr. Secretary, that you understand this, and I am confident, as always, that you will continue to lend your moral authority to the struggle against terrorism. Mr. Secretary, no country would tolerate rocket attacks against its cities and against its civilians. Israel cannot tolerate such attacks. If a long-term solution can be put in place through diplomatic means, than Israel would be a willing partner to such a solution. But if stronger military action proves necessary to stop the constant barrage of rockets, Israel will not hesitate to do what is necessary to defend our people. I look forward to our discussions today, and I hope we can advance a peaceful resolution. Secretary Ban: Thank you, Mr. Prime Minister. Shalom, ladies and gentlemen. Todah. Again, I’d like to thank the Prime Minister for welcoming me to Israel at this time. Regrettably, I’m back again in the region only nine months since my last visit because of violence in Israel and Gaza, this again requiring our attention, not progressing towards a lasting peace and a two-state solution. But all this we are truly concerned at the rising loss of human lives. A further escalation would be dangerous and tragic for Palestinians and Israelis, and would put the entire region at risk. I’m here to appeal to all to hold fire and restore calm. Rockets have hit areas just outside of Tel Aviv and Jerusalem, as well as Israeli towns near Gaza, killing and injuring civilians. I myself visited Sderot and these cities, and met many people, and I was able to witness myself how these people were living in fear and terror. This is unacceptable, irresponsible and reckless. I strongly condemn these actions. Rocket attacks by Palestinian militants targeting Israel must cease immediately. I know how desperate the situation is here, but Israel must exercise maximum restraint. I strongly caution against a ground operation which will only result in further tragedy. I have also stressed that while Israeli rockets may be aimed at military targets inside Gaza, they kill and injure civilians and damage civilian infrastructures. The loss of civilian lives is unacceptable under any circumstances. The excessive use of force is unlawful and must be rejected, and I take note of your statement that this military operation was aimed against only military facilities, but still in the course of military operations, the civilians are actually victimized, as we have seen. My paramount immediate concern is for the safety and well-being of all civilians, in Israel and in Gaza. Innocent people, including children, are being killed and injured on both sides. I appeal to all and those commanding, bearing and operating arms, weapons, to respect international humanitarian law to ensure the protection of civilians at all times. I was here under similar circumstances in early 2009. It is truly painful for me to be back for the same reason. This new cycle of bloodshed will make neither Israelis nor Palestinians more secure, nor will bloodshed open the door to negotiations that could achieve a two-state solution necessary to end such violence permanently. Further escalation benefits no one. I and all my staff, including Special Coordinator Robert Serry, will spare no effort to put an end to violence and provide humanitarian assistance to those who need it. Over the past week, Mr. Prime Minister, I have spoken with many international leaders and regional leaders by telephone and in person. I have come here directly from Cairo, where I met with Arab League Secretary General Nabil al-Araby and Egyptian Prime Minister Hesham Mohamed Qandil earlier today. Egypt is a leader in the region, and I was encouraged that the Egyptian authorities are using their contacts on all sides to seek an immediate ceasefire. I’ve also met Foreign Minister Leiberman and Defense Minister Barak this afternoon since arriving in Jerusalem. I will be meeting President Peres after our meeting with you this evening, and Palestinian President Abbas tomorrow morning. I’m here to offer my help and good offices to end the violence and find a path back towards a peaceful resolution of the conflict. The world is watching and waiting. We have not a moment to lose. Again, Mr. Prime Minister, I count on your strong leadership while working together with the United Nations for peace and stability and human rights in this region.